Some rare footage of the Beatles' visit to the South West has been unearthed in the BBC library in Plymouth. 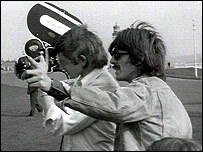 The film of them at Plymouth Hoe in 1967, as part of the "Magical Mystery Tour", was found during a transfer of old film reel onto digital format. It is part of the uncut original film - much of it unseen for nearly 40 years. Last October, film of the Fab Four during a visit to the region in 1964 was found wrongly stored in the sports section of the South West Film Archive. Images of the Beatles in the region are rare, but local historian and Beatles fan Chris Robinson, found one picture and produced a poster of John Lennon, Paul McCartney, George Harrison and Ringo Starr sitting on Plymouth Hoe. Mr Robinson said: "It's so obviously Plymouth Hoe, with Smeaton's Tower in the background and the 'wow' factor of the four of them in one place that you can say 'I know where that is'."